Like all of our 4x6 post caps, our cedar-colored pyramid 4x6 post caps are part of the Estate Series. The cedar designation refers to the color, and it distinguishes this redder shade of brown from the brown fence post toppers that are also part of the Estate Series. We manufacture many of our own fence post caps, and our production takes place in the USA. We use ASA resin because we believe that a substance that’s good enough for the automobile and marine vehicle industries ought to be equally effective for fence post toppers. ASA resin is UV and impact resistant, so no matter where you live or how harsh your weather is, our fence posts will withstand whatever Mother Nature throws at them. These nominal fence post caps are designed to fit 4x6 posts whose exact measurements range from 3.5 to 5.5 inches or 3.875 to 5.875 inches. We are so convinced of the superior durability and strength of our fence post toppers that we offer a 10-year guarantee against discoloration, fading, or warping. 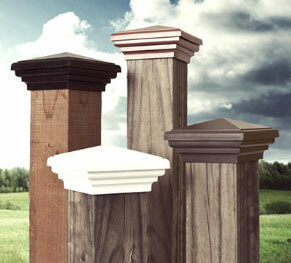 We designed our fence post caps to fit a vast range or landscape and architectural styles. We carry a variety of color options from which you can choose. The ASA resin from which our post caps are made won’t decay or erode, and you won’t have to worry about destruction from gnawing animals like squirrels and chipmunks, or insects. We offer the only patented fence post caps on the market. Our SNAP-CAP installation method makes it so easy to install our fence post toppers that you can do it yourself. Once your post caps are installed, you won’t have to worry about maintenance concerns that exist with comparable wood products. And the best part is the fact that our post caps cost far less than solid wood ones, and they last longer, too. Our pride in customer satisfaction extends to customer service. To that end, we offer a 100% satisfaction guarantee. If you aren’t satisfied that the Atlanta Post Caps product you purchase is right for your fence posts, we will refund your full purchase price.